Nearly a week after the Camp Fire devastated an entire town, destroying 7,600 homes and at least 260 commercial properties, officials say hundreds of people are still missing, and many among them are senior citizens. An updated list from the Butte County Sheriff’s Office shows that a significant number of the individuals identified as missing comprises people over 65. According to the U.S. Census Bureau, people aged 65 years and older make up about 25 percent of the population of Paradise, the town of 27,000 people that was nearly completely destroyed last week as the Camp Fire overtook the area. Nearly 50 people are confirmed dead after the Camp Fire ravaged Northern California, becoming the most deadly and destructive fire in the state’s history. Butte County Sheriff and Coroner Kory Honea called the process of locating the dead “very, very difficult” and added that there’s an “unfortunate possibility” that human remains may be located even after people return to the area. The Camp Fire began last week and spread quickly, burning at an alarming rate of up to 80 acres per minute and leaving little time to escape. Strong winds and very dry conditions led to a rapid spread of the flames, and traffic jams further complicated evacuation efforts. Harold Taylor, a 72-year-old veteran and evacuee, told the Associated Press that he attempted to convince a neighbor to leave the area with him but that the neighbor refused. Taylor said he and others “didn’t have 10 minutes to get out of there,” and he doesn’t know what happened to the individual. Some residents in the area have raised concerns that warnings about evacuations were not sufficient. Christina Taft, another evacuee who told NBC News that her 67-year-old mother was missing, said officials “definitely didn’t do enough” to notify those in the area of the severity of the fire. In one harrowing account of how residents narrowly escaped the Camp Fire’s flames, more than a dozen people were forced into in the nearby Concow Reservoir after becoming walled off by the inferno, according to the San Francisco Chronicle. At least one of the individuals identified was 90 years old. As of Wednesday, the fire was still only 35 percent contained, according to the California Department of Forestry and Fire Protection, and had burned more than 135,000 acres. Honea said that more than 100 National Guard troops would help in the ongoing effort to locate human remains. Update 11/15/18, 5:05 p.m. ET: The Butte County Sheriff’s office released an updated list of missing persons today, and the situation looks even grimmer. The list is now about 300 long, more than double what it was yesterday. The Sheriff’s office told NPR that the list has ballooned in part because some folks are only just contacting authorities about a missing loved one. Whatever the reason, the fact that this list continues to grow a week after the fire started is a very bad sign. Update 11/15/18, 9:45 p.m. ET: During a press conference Thursday evening, officials said that the list of missing persons jumped to a total of 631 individuals unaccounted for. The Butte County Sheriff’s Office said that the number reflected information it received on individuals reported missing to its call centers as well as from its own 911 dispatch records logged during the fire. Update 11/16/18, 9:30 p.m. 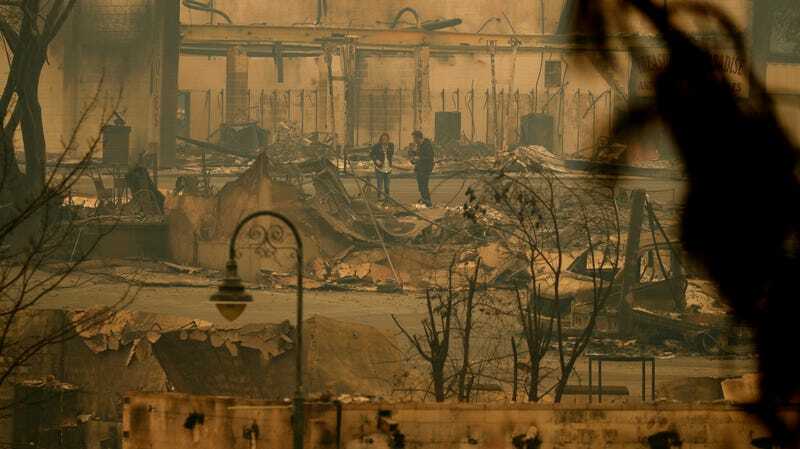 ET: More than 1,000 people are unaccounted for in the Camp Fire, according to the most recent figures from officials in the area. As of Friday evening, more than a week after it began, the fire had burned 142,000 acres and was 45 percent contained.